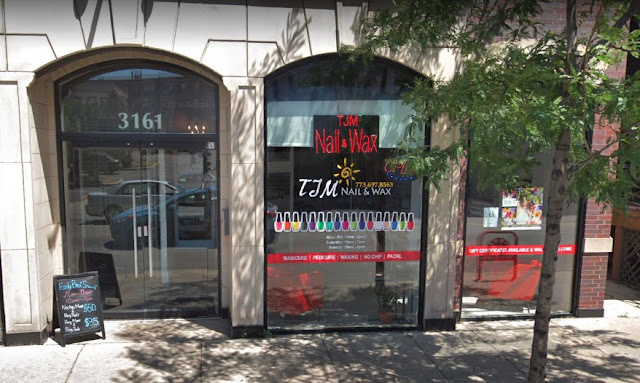 Three people posed as customers in a Boystown-area nail salon, received treatments, then pepper-sprayed the staff and robbed them of property around 8:30 p.m. on Wednesday, police said. Two offenders are in custody. Police said the trio entered TJM Nail & Wax at 3161 North Halsted and asked to have their nails done. When it came time to pay, the offenders sprayed a large amount of pepper gas inside the salon and stole the company’s laptop as well as one of the worker’s handbags, according to police. The staff, overcome by the noxious gas, fled into Halsted Street, asking passers-by to call for help, according to a witness. Two offenders were arrested nearby after brief foot-chases, police said. Still at-large is a transgender woman with long black hair who was wearing a pink, puffy waist-length jacket. Police officers recovered the store’s computer and the employee’s purse. • At 9:20 last night, an Uptown woman was robbed of her car keys and cell phone in an alley between the 4500 blocks of North Paulina and North Ashland. The woman suffered facial injuries from a man who implied that he was armed. She described the man as being black, over 6-feet-tall, and wearing an olive green hoodie with black pants. He was last seen heading southbound and then westbound. • A senior citizen was knocked to the ground in an attempted robbery outside the Sheridan Red Line station on Monday evening, police said. The victim was attacked just before 6 p.m. by a man who then tried to take his valuables. An ambulance was called to treat the victim. Police described the offender as a 21-year-old black male who stands 5’6” tall and weighs about 150-pounds. He was wearing a red hoodie and had a mohawk hairstyle with a goatee. • On Sunday evening, a woman reported being robbed in the 1600 block of West Grace Street around 10:30 p.m. The victim told police that two men got out of a black Ford Focus and forced her to give up her purse before they returned to the car and sped off westbound on Grace, then northbound on Marshfield. The robbers discarded the woman’s phone in the 1200 block of West Byron and police recovered it for the victim. Police said the offenders were two white or Hispanic men who wore masks. • A 37-year-old man was hit in the head with a wrench by three men who approached him behind in the 1900 block of West Roscoe early on Friday, Nov. 16th. The man was walking home from a bar around 2:30 a.m. when the three attacked him without saying anything. Police suspect the incident was an attempted robbery. The victim managed to slip away from the offenders before losing any property to them.